Marble is a metamorphic rock, formed when limestone is subjected to extremely high pressures and temperatures within the earth's crust. These forces change the texture and composition of limestone to create large grains of calcite, a process called recrystallization. In its natural form, marble is completely white. This is the rarest and most valued variety of marble, and is often used for sculptures and statues. Most marble has veining mineral deposits throughout, resulting in such shades as cream, beige, gray, and rich reds, greens, and even jet blacks. Because of its elegant, naturally random appearance, engineering characteristics, and ease of maintenance, marble is an exquisite choice for bathroom vanity tops, tabletops, wall claddings, and wainscot. Many marbles are impervious to moisture and suitable for wet environments, extending the versatility of this stone to include tub decks and showers. Marble and is vulnerable to attack by mild acids, including those commonly found in kitchen and bar settings. Also, compared to granite, marble is a much a softer stone. It shouldn’t be cut on, because it will scratch easily. It's not as soft as soapstone, however. 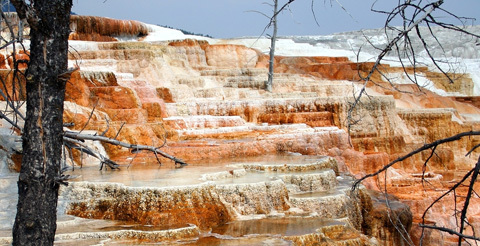 Travertine is a sedimentary rock formed near hot bubbly mineral rich springs. Similar to limestone in mineral composition, travertine is uniquely characterized by natural cavities in its surface as gas bubbles become trapped and create a pitted surface on the stone. Travertine comes in a variety of earthy hues for a warm, natural look; from soft ivories to pale creams, rich shades of golden honey and silvery greens to deep mocha browns. 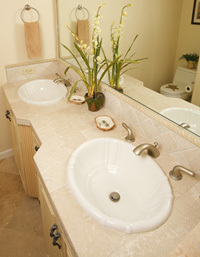 Travertine never appears as one solid color. Decorators integrating these soft tones into their designs have great flexibility in selecting complimentary colors for other interior elements. Vulnerable to alteration by exposure to mild acids, travertine is used in fireplace surrounds, tub surrounds, vanity tops, and end tables. Soapstone is a siliceous natural stone, consisting mainly of talc and chlorite. As talc in soapstone is soft to the touch, its feel is smooth and silky, warm and inviting. It’s a soft stone, softer than other natural stones, and you wouldn’t want to cut on it. Soapstone is charming, rustic, and rich looking, yet versatile enough to fit comfortably within a modern home. Despite its relative softness, soapstone’s dense composition makes it practically indestructible. Unlike some other natural stones, it’s nonporousand won’t absorb liquids and stains, and it’s inert, so acids won't etch it. Soapstone is heat resistant, but also a very efficient heat conductor and radiator. You can burn wood or any variety of fuels in a soapstone fireplace, and the material will absorb and continue to radiate heat long after the fuel has been consumed. 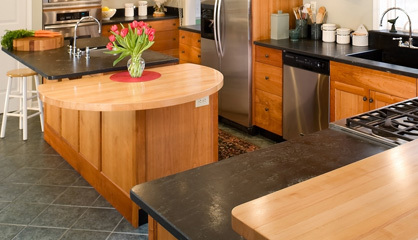 Due to these durable features, soapstone has been used in science classrooms and laboratories for work tables and sinks for over one hundred years. Soapstone is a darker natural stone and comes in shades of grayish to green to blues, and charcoal gray. Random markings include white veining, shades of green, amber or beige in the shape of veins or other formations. A protective coat of mineral oil makes its color even more dramatic. Because of its unparalleled heat retention characteristics, it’s the perfect choice for cook tops, fireplace hearths and fireplace surrounds. 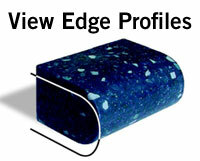 It’s also used for countertops, backsplashes, sinks, table tops, and bathroom vanities and shower stalls. Onyx is a sedimentary rock formed as stalactites and stalagmites in cave interiors. It is quartz crystals fused together into translucent layers of stone. Onyx is also used as a mineral gem. The translucent beauty of onyx is a real head turner. This natural stone has unique and intricate designs, translucency, and contrasting colors (mainly in white, yellow/ honey, brown, pink and green) that are soft and sensuous, almost fragile looking. A softer stone vulnerable to chemicals and abrasives, onyx is best placed where it won’t see heavy day-to-day use, such as fireplace surrounds and vanity, table and bar tops. Quartzite is a metamorphic rock formed from sandstone. Through heating and pressure the original quartz sand grains and quartz silica cement are fused into one. Normally quartzite is white or light grey, but it may be found in a variety of other colors including yellow, light brown, blue, green, purple, black, shades of pink or red depending on other minerals that may be present. Quartzite is one of nature's most durable stones, of exceptional strength, density, and hardness. Non-porous, heat resistant with a low absorption rate and impervious to stains, quartzite is used for fireplace surrounds and wall cladding, as well as many exterior applications.